BMW takes the cover off the new 6 Series Convertibe at the LA Auto Show 2010. 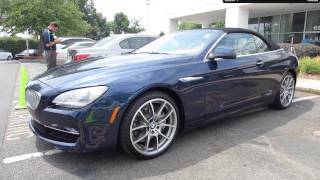 The new BMW 650i Convertible 2012 builds on top of the standard convertible features like sweeping bonnet, set-back passenger compartment, long wheelbase and flat waistline. Built in Dingolfing, Germany, the 650i Convertible Available in two engine options: 8-Cylinder 407 HP engine and 6-Cylinder in-line BMW TwinPower Turbo 320 HP engine. Words such as “breathtaking”, “irresistible” and “flawless” pepper the history history of BMW convertibles. And now the brand has added a new chapter to a tradition of open-top cars that stretches back decades. The new BMW 6 Series Convertible fulfils the wishes of discerning automotive aesthetes with its finely honed sense for sporty driving pleasure, groundbreaking luxury and sparkling looks. In the exclusive environs of the premium convertible market, the 2+2-seater makes a convincing case for itself with the most efficient engines, most advanced chassis technology and most innovative comfort, infotainment and safety features in its segment. A sweeping bonnet, set-back passenger compartment, long wheelbase and flat waistline embody the hallmark proportions of a BMW convertible. The new BMW 6 Series Convertible combines these features with a classic soft-top roof in customary “fin” design. Powerfully contoured surfaces and the surging dynamism of its lines promise assured driving properties. The luxurious ambience of the interior is highlighted by the driver-oriented cockpit set-up and wraps the front passenger and rear passengers in a feeling of exclusive security. Nowhere is the high-class functionality of the interior underlined more prominently than in the redesigned freestanding Control Display of the standard-fitted iDrive control system. The new BMW 6 Series Convertible is available with two engine variants from launch. The eight-cylinder powerplant in the BMW 650i Convertible produces 300 kW/407 hp, while an exclusive variant of the six-cylinder in-line engine with BMW TwinPower Turbo, direct injection and VALVETRONIC –generating 235 kW/320 hp – has been developed for the BMW 640i Convertible. Both engines team up as standard with an eight-speed Sports automatic gearbox. 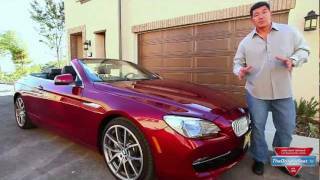 Standard-fitted BMW EfficientDynamics features include the Auto Start-Stop function in the BMW 640i Convertible. Chassis technology unmatched in its segment works in tandem with the cutting-edge engines to ensure even greater dynamic capability and a similarly discernible improvement in ride comfort compared to its predecessor. The new BMW 6 Series Convertible comes as standard with Drive Dynamic Control, which allows drivers to choose their own suspension settings, while the Adaptive Drive system is available as an option with electrically controlled dampers and roll stabilisation. In addition to the standard-fitted electromechanical power steering, another unique feature in this segment is the optional Integral Active Steering system. The new BMW 6 Series Convertible also underlines its progressive character with numerous BMW ConnectedDrive features that none of its rivals can match. The selection of optional driver assistance systems includes a rear-view camera, Surround View, BMW Night Vision with pedestrian recognition and BMW Parking Assistant. The new BMW 6 Series Convertible is the only car in its segment to be available with a Head-Up Display. Making its debut in the new soft top, the latest generation of the system uses a broader palette of colours and three-dimensional graphics to create an even sharper image. The design: athletic elegance, natural sportiness and sparkling looks. The luxurious yet dynamic driving experience of the new BMW 6 Series Convertible is reflected in the athletic elegance and sense-tingling sportiness of its exterior design. A long, sweeping bonnet, set-back passenger compartment, long wheelbase and flat waistline combine to create the proportions typical of a BMW convertible. The precise interplay of eye-catching lines and meticulously sculpted surfaces help to give the new BMW 6 Series Convertible its arresting looks. Like the lines projecting out from the nose of the car and continuing along its full length, the harmoniously curved surfaces of the body take their cue from the movement of waves sent out by a the bow of a motor boat piercing the water. Continuing the theme, the waistline surface which leads the body into the interior mimics the character of a boat deck. The front end: surging forward and focusing on the road. The new BMW 6 Series Convertible also displays its dynamic character in its front end design. The large, slightly forward-slanting BMW kidney grille – its “shark nose” – gives the car a sense of surging forward, while a broad air intake, strikingly contoured bonnet and muscular wheel arches hint at its powerful engine technology and impressive roadholding. High-quality chrome elements positioned on the outer edges of the front apron further accentuate the width of the car. The optional foglamps consisting of a string of three LED units are placed in front of these chrome elements. The standard xenon headlights of the new BMW 6 Series Convertible pick up on the brand’s familiar “twin round” look. As standard, an accent strip cuts across the top of them; this is replaced by an LED accent light if the optional Adaptive Headlights are specified. The daytime running lights take the form of LED light rings, whose bright white light illuminates the distinctive front end look. A horizontal light strip below the daytime running lights, meanwhile, performs direction indicator duties. Side view: elongated lines, athletic curves. Uninterrupted, flowing lines lend the silhouette of the BMW 6 Series Convertible a sweeping elegance. Powerful curves mimicking the natural movement of waves give the car’s side view a natural athleticism. The hallmark BMW swage line at door handle level is spawned in the front wheel arch gill – which houses the side indicator – and extends all the way back into the rear lights. Another character line is released from the bulge of the front wing, stretching powerfully over the front wheel like a wave before dropping down and continuing horizontally towards the rear. Together with the swage line, it creates a dynamic wedge shape which emphasises the car’s forward-surging character. The striking V-shape and accentuated width of the rear end create a powerful appearance. Wide and flat surfaces define the rear of the new BMW 6 Series Convertible. The dominance of horizontal lines adds extra emphasis to the wider track of the new car compared to its predecessor. In addition, downward-converging lines underline the car’s focus on the road, echoing the approach at the front end. This distinctive V-shape is created by lines including the side edges of the boot lid, the licence plate surround and the contours of the reflectors positioned in the bumper. The slightly concave lower section of the boot lid produces light and shade effects which lend an extra lightness to the rear of the car. The two-part rear light clusters give the brand’s familiar L-shape a particularly sporty, dynamic edge. Inside the units, two LED-powered light strips create the familiar BMW night-time look. The indicators and brake lights are also LED units. The interior: seats for four – and each one made to measure. The new BMW 6 Series Convertible is designed to be a 2+2-seater. Its interior offers individually tailored seats for the driver, front passenger and rear passengers. High-quality materials, carefully coordinated colours and, once again, meticulously formed surfaces combine to produce an ambience defined by luxury, sweeping dynamism and stylish functionality. A hallmark BMW element of the interior design is the driver-oriented cockpit layout. The central section of the instrument panel, containing the iDrive system’s Control Display, the central air vents and the controls for the audio system and air conditioning, are all angled slightly towards the driver. Added to which, the gearshift lever and the buttons for the parking brake, roof operation and Drive Dynamic Control are located on a surface that opens out towards the driver and is set lower than the front passenger side of the centre console. The front passenger area is bordered by a surface curving elegantly from the armrest over the side edge of the centre console, upwards and outwards into the instrument panel and then horizontally into the door trim. This provides a harmonious surround for the front passenger area, creating a feeling of exclusive security. The contour of the rear waistline surface, which extends slightly into the interior between the head restraints, highlights the individual seat layout of the rear. Premiere: freestanding Control Display with flatscreen design. Exclusive and distinctive: the fin roof. The new BMW 6 Series Convertible again comes with an electrically powered soft-top roof with “fin” architecture. The multi-layer roof – which has been optimised once again in terms of its acoustic properties and structural rigidity – offers outstanding thermal insulation and thus enables the new convertible to be used comfortably all year round. The fins project out along the flanks of the 6 Series into its rear section, accentuating the car’s gracefully sweeping silhouette even more keenly than on its predecessor and giving it an unmistakable appearance. The upshot is that the transition of the roof line into the rear end flows as smoothly as on a hard-top coupé. The upright, heated, glass rear window is positioned directly behind the rear seats and can be lowered separately from the roof. The automatic opening and closing operation for the roof is activated as standard using a button on the centre console. The Comfort Access option allows the process to be initiated using the remote control button on the car key. Opening the roof takes 19 seconds, the closing process 24 seconds. Both operations can be activated while on the move at speeds of up to 40 km/h (25 mph). The fin roof of the new BMW 6 Series Convertible is available in three colour variants, including new Anthracite Silver effect, which adds a stylish lustre. Two non-metallic exterior paint finishes and seven metallic shades are available. As an alternative to the standard Dakota leather trim, customers can also specify the Exclusive Nappa leather variant which can be ordered in four colour options. As well as the instrument panel, the centre console and the upper sections of the rear door panel and side trim can also be lined with Exclusive Nappa leather as an option. Plus, interior elements covered with Exclusive Nappa leather can also be ordered with optional stitching in a contrasting colour. The double stitching stands out from the leather surface, lending a particularly elegant flourish to the design of the interior. Optimised seat comfort; boot capacity can be expanded as required. At 4,894 millimetres (192.6 in.) in length, the new BMW 6 Series Convertible is 74 millimetres (2.9 in.) longer than its predecessor. Its similarly extended wheelbase now stretches to 2,855 millimetres (112.4 in.). The car has also grown by 39 millimetres (1.5 in.) in width, and now measures 1,894 millimetres (74.5 in.) across, while 9 millimetres (0.35 in.) have been shaved off its height (now 1,365 mm / 53.7 in.). These dimensions not only create a significantly more powerful and, at the same time, elegantly sweeping overall impression, they also take interior spaciousness to new levels. Despite its lower height, the new BMW 6 Series Convertible offers greater headroom in both the front and the rear. Added to which, the height adjustment of the driver and front passenger seats cover a greater range. The increase in the width of the interior is noticeable from all four seats, and passengers in the rear seats also benefit from additional legroom. The tilt angle of the rear seat backrest has seen further optimisation over the predecessor model and now achieves virtually the same angle as you will find in BMW saloons. A ski bag with an opening in the rear seat backrest is available as an option and offers space for two sets of skis. The new BMW 6 Series Convertible boasts 300 litres (10.6 cu. ft.) of boot space with the roof open, allowing two 46-inch golfbags and a business case to be accommodated. With the roof closed, the variable soft-top stowage compartment can be folded up in a single movement to increase boot capacity to 350 litres (12.3 cu. ft.). Newly developed lightweight seats, comprehensive safety equipment. The new BMW 6 Series Convertible is fitted with newly developed lightweight seats with an integrated seatbelt system, and the seats are available in three variants. As an alternative to the standard items, customers can also order sports seats with integral head restraints or comfort seats with a wider range of adjustment. All seat variants come with crash-activated head restraints. The range of standard safety equipment also includes front airbags, head-thorax side airbags integrated into the seat frame, three-point automatic belts for all seats, belt force limiters and front belt tensioners, ISOFIX child seat mounts in the rear and a roll-over protection system. The roll-over system further developed specifically for the new BMW 6 Series Convertible consists of two bars placed behind the rear head restraints. As soon as the central safety electronics register a danger of the car rolling over, the pyrotechnic release mechanism is activated, at which point the high-strength aluminium bars rise up from their rest position in a fraction of a second. Carefully targeted advances in the use of materials and in the development of the car’s load-bearing structure have significantly enhanced the body’s construction in terms of the agility and safety it offers. Its static torsional rigidity is now around 50 per cent greater than that of its predecessor. In the interests of weight optimisation, the doors, bonnet and front axle spring mounts are all aluminium, while the front side panels, roof lid and boot are made from glass fibre composite. Majestic power: eight- and six-cylinder engines with BMW TwinPower Turbo. Instantaneous power development and majestic torque are the stand-out features of the two engines available for the new BMW 6 Series Convertible from launch. The V8 powerplant and six-cylinder in-line unit both have BMW TwinPower Turbo technology and direct injection, and combine their sporting character with outstanding smoothness and exceptional efficiency. The 4.4-litre eight-cylinder engine in the new BMW 650i Convertible develops a maximum 300 kW/407 hp between 5,500 and 6,400 rpm, and puts its peak torque of 600 Newton metres (443 lb-ft) on tap between 1,750 and 4,500 rpm. This unique engine, whose turbochargers are positioned in the V-shaped area between the cylinder banks, produces an instantaneous and sustained wave of power, making it a feast for the enthusiast driver. The new BMW 650i Convertible completes the sprint from 0 to 100 km/h (62 mph) in 5.0 seconds, and the engine electronics eventually step in to halt acceleration at 250 km/h (155 mph). This range-topping engine also boasts extraordinary efficiency for a model in its output class, as average fuel consumption of 10.7 litres per 100 kilometres in the EU test cycle (26.4 mpg imp) and CO2 emissions of 249 grams per kilometre clearly show. The six-cylinder in-line engine under the bonnet of the new BMW 640i Convertible complements its BMW TwinPower Turbo technology and petrol direct injection with VALVETRONIC fully variable valve control. All of which enables the 3.0-litre unit to develop a maximum 235 kW/320 hp at 5,800 rpm and maximum torque of 450 Newton metres (332 lb-ft) between 1,300 and 4,500 rpm. This engine propels the BMW 640i Convertible from 0 to 100 km/h (62 mph) in 5.7 seconds and on to an electronically limited top speed of 250 km/h (155 mph). Its average fuel economy in the EU test cycle comes in at 7.9 litres per 100 kilometres (35.8 mpg imp), while CO2 emissions are 185 grams per kilometre. Eight-speed Sports automatic and BMW EfficientDynamics as standard. The eight-speed Sports automatic gearbox fitted as standard in the new BMW 6 Series Convertible boasts a combination of sportiness, shift comfort and efficiency unmatched in its segment. Its minimal converter slip and rapid and precise gear changes set it apart from the crowd. An innovative gear set configuration allows this transmission to offer eight gears and a correspondingly wide gear range – which optimises the car’s sprinting power yet also allows the driver to save fuel by driving at low revs – despite its compact construction and low weight. The driver can also change gear manually using shift paddles on the steering wheel. In addition to the efficiency of the engines and eight-speed Sports automatic, an extensive range of BMW EfficientDynamics measures also contribute to reducing fuel consumption and emissions. Technology such as Brake Energy Regeneration, Electric Power Steering (EPS), the need-based operation of ancillary components, intelligent lightweight construction and low-rolling-resistance tyres ensure maximum efficiency. Plus, the new BMW 640i Convertible is also equipped with automatic active air flap control and the Auto Start-Stop function. When the driver draws to a standstill at junctions or in a traffic jam the engine is automatically switched off. As soon as the driver releases the brake pedal, the engine starts up again. If the driver is using the Auto Hold function, the engine is restarted when the accelerator is depressed. Advanced chassis technology including Electric Power Steering; Integral Active Steering available as an option. Cutting-edge chassis technology gives the new BMW 6 Series Convertible the tools it needs to lay on sporty handling characteristics and exceptional comfort. Both the double track control arm and the integral rear axle are made predominantly from aluminium. The chassis set-up is geared to the requirements of drivers with sporting intentions, although the dampers also respond sensitively to bumps in the road surface under high lateral acceleration. The optional Adaptive Drive system, which includes Dynamic Damper Control and the Dynamic Drive active roll stabilisation system, offers the driver even more precise responses. The electronically controlled dampers adapt to both the nature of the road surface and the driver’s style to prevent unwanted movements in the car body. The roll stabilisation system reduces factors such as body sway in fast-driven corners and sudden direction changes. Electric Power Steering with Servotronic serves up the familiar BMW recipe of precision, comfort and efficiency, and is unique in the BMW 6 Series Convertible’s segment. Added to which, the new BMW 6 Series Convertible is the first car in its class that can be ordered – as an option – with Integral Active Steering. This system combines the Active Steering system for the front axle already available for the predecessor model with a steering rear axle, allowing the steering angle and power assistance to be controlled at both the front and the rear with the help of electric motors. Precisely harmonised wheel turns pave the way for extraordinary agility in dynamic driving situations. And Integral Active Steering also displays an impressively deft touch around twisty mountain passes and in city traffic. Drive Dynamic Control allows a choice of suspension settings. With Drive Dynamic Control the virtues of sportiness and comfort can take precedence as the situation demands. The driver can make his own choice of suspension settings in NORMAL, SPORT and SPORT+ modes using a button on the centre console. If the Adaptive Drive option has been specified, he can also make use of the COMFORT setting. In this mode, as well as adjusting the accelerator pedal progression, engine responses, power steering characteristics, DSC response thresholds and the shift dynamics of the automatic gearbox, Drive Dynamic Control also tweaks the damper responses and roll stabilisation settings. On cars fitted with Integral Active Steering, the basic steering set-up is also adjusted according to the mode selected, not just the level of power assistance. As a result, in SPORT and SPORT+ modes the car’s sporting responses are sharpened even further. The lightweight floating-calliper brakes with inner-vented discs are easy to use with precision, and their effectiveness is reinforced by Dynamic Stability Control (DSC). This driving stability system brings together technology such as the Anti-lock Braking System (ABS), Dynamic Traction Control (DTC), Cornering Brake Control (CBC), Dynamic Brake Control (DBC), the Start-off Assistant, the automatic Brake Drying function and brake fade compensation. Standard equipment also includes 18-inch light-alloy wheels on the new BMW 650i Convertible or 17-inch rims for the new BMW 640i Convertible, as well as runflat tyres and a runflat indicator. Cutting-edge comfort-enhancing features and exclusive options from BMW ConnectedDrive. Among the comfort-enhancing features included as standard in the new BMW 6 Series Convertible are 2-zone automatic climate control with convertible mode, a hi-fi audio system with CD player and AUX-IN socket, a multifunction steering wheel, electrically operated front seats with memory function and a rain sensor with integrated automatic driving lights control. Among the highlights of the optional equipment list are Adaptive Headlights, a heated steering wheel, active seat ventilation, active seats and the Navigation system Professional with a hard disk for storing maps and personal music collections. The new BMW 6 Series Convertible is available with an even greater variety of driver assistance systems and mobility services from BMW ConnectedDrive. It can be ordered with technology such as the Lane Change Warning System, Lane Departure Warning System, Speed Limit Info, BMW Night Vision with pedestrian recognition, rear-view camera, Surround View and the BMW Parking Assistant. Innovative technologies optimise the integration of the Apple iPhone and other smartphones, as well as music players. And, in addition to internet access, BMW ConnectedDrive also allows email messages received on a smartphone to be shown on the Control Display as well as the use of internet-based services for navigation and entertainment. What’s more, the latest-generation Head-Up Display – a unique feature in this class – is making its debut in the new BMW 6 Series Convertible. The system projects driving-related information onto the windscreen within the driver’s direct field of view. The three-dimensional graphics are now displayed using a full spectrum of colours, allowing real-life traffic symbols to be accurately depicted. The BMW 6 Series Convertible: exclusive driving pleasure and a unique heritage. The new BMW 6 Series Convertible sees the world’s most successful manufacturer of premium cars building on an unparalleled tradition. The allure of exclusive driving pleasure in open-top BMW sports cars continues to hold a magnetic attraction after more than 70 years. The extraordinary history of BMW convertibles stretches from the legendary BMW 328 – which provided the basis for the winning car in the 1940 Mille Miglia – via the highly coveted BMW 507 of the 1950s, to the dynamic and groundbreaking predecessor to the new BMW 6 Series Convertible. The new BMW 6 Series Convertible is built at the BMW plant in Dingolfing, Germany. Also rolling off the assembly line at the BMW Group’s largest production plant are the BMW 7 Series and BMW 5 Series models. The flexible and efficient processes at the plant combine state-of-the-art production technology with a standard of quality defined by meticulous craftsmanship in the manufacture of premium cars configured to customer requirements.